Following a nail-biting 3-2 home loss to No. 5 Clarkson, the Quinnipiac women’s ice hockey team was taken down in a 5-4 home loss to St. Lawrence on Saturday afternoon in Hamden. The Saints (13-12-3 overall, 8-6-2 ECAC Hockey) lit up the Bobcats (9-16-3 overall, 6-9-1 ECAC Hockey) in a high-scoring affair. Defense, or lack thereof, was the issue for the Bobcats in the matchup. Despite finishing the game in poor fashion, the Bobcats started off strong. Junior forward Sarah-Eve Coutu-Godbout scored the first goal of the game and her fourth of the season off a rebound. Just two minutes later, though, St. Lawrence answered with a goal of its own. Junior defenseman Amanda Butterfield found the net from just in front of the blue line. The game was tied at one with 12 minutes of game left to play in the first period. The Saints weren’t done just yet, though. With four minutes remaining in the first period, graduate student Kayla Nielsen scored her fourth goal of the season after a poor pass from Quinnipiac in its defensive zone. Quinnipiac bounced back early in the second period with a goal by sophomore forward Brooke Bonsteel. She fired a wrister past senior goaltender Grace Harrison for her second goal of the season. The Bobcats lost control of the game soon after. A three-goal onslaught from the Saints concluded the second period at 5-2. One of the three was Nielsen’s second of the night and fifth on the season. With one period to play, the Bobcats came out firing on all cylinders. They outshot the Saints 18-3 and put in two late goals to cut the deficit to one. Unfortunately for Quinnipiac, its offensive explosion was too little, too late as St. Lawrence came out victorious. Quinnipiac is going to put its recent losses behind it as it heads into next weekend’s games against Yale and Brown. 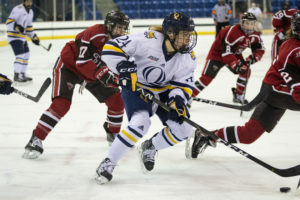 A tough weekend won’t change Quinnipiac’s approach for next weekend’s games. 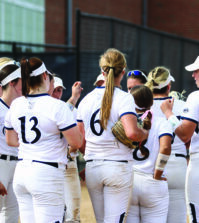 The team is back on the road as it travels eight miles to Yale on Friday, Feb 8 at 6 p.m.